Asthma is a leading chronic illness among children and adolescents. It is also one of the leading causes of school absenteeism. On average, in a classroom of 30 children, about 3 are likely to have asthma. Low-income populations, minorities, and children living in inner cities experience more emergency department visits, hospitalizations, and deaths due to asthma than the general population. Asthma-friendly schools are those that make the effort to create safe and supportive learning environments for students with asthma. 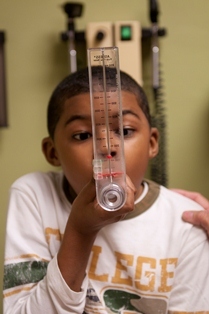 They have policies and procedures that allow students to successfully manage their asthma. The American Lung Association, the National Asthma Education Prevention Program (NAEPP), the Environmental Protection Agency and other asthma experts have all recognized that asthma management education is an important part of making schools asthma-friendly. The Centers for Disease Control and Prevention recommends that all schools provide asthma education programs for students and school staff. Open Airways for Schools is the most widely recognized asthma management program for children in the nation. Since being introduced over a decade ago, Open Airways for School has reached hundreds of thousands of children with asthma in more than 40,000 elementary schools across the country. The program has been approved and recommended by the National Association of School Nurses, and honored with a Health Education Research Award from the National Asthma Education Prevention Program (NAEPP). It has also been cited by the Centers for Disease Control and Prevention as a program proven to be very effective for childhood asthma management.